Yoshi on the Chime Ball. A Chime Ball is a silver-like ball with a red treble clef on it. It is also an item found only in Yoshi Topsy-Turvy. Chime Balls help Yoshi get through levels. 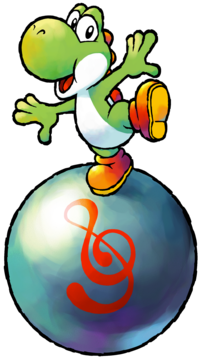 Sometimes, the Chime Ball rolls over a Chime Note, causing a Note to appear, which Yoshi can use as a platform. Yoshi can jump onto the ball and when the Game Boy Advance is tilted ( ), the Chime Ball rolls in the corresponding direction. They are also found in Shuffle Mode. This page was last edited on August 2, 2018, at 20:28.